"The Chiefs are 6-0 against the Rams over the years, but that counts for little as they prepare to face a team which didn't lose their first game until week 9 and are one of the favourites for the Super Bowl next February." The big game of the weekend sees the 9-1 Rams face the 9-1 Chiefs as two of the most potent offences in the league go head-to-head in what many people believe could be a dress rehearsal for the Super Bowl and is just the fifth meeting since 1970 between teams with one or fewer losses in Week 11 or later. The game was initially to be held in Mexico City but due to the poor nature of the pitch at the Aztec Stadium has now been moved back to Los Angeles and at nearly 7,400 feet above sea level we can only guess how many points would have been scored in those conditions. Even so, The Chiefs are the second highest scoring team in the NFL with an average of 35.3 points per game and the Rams aren't far off them, ranking third overall with a not too shabby 33.5 points per game, so it's unlikely that the move will make that much of a difference. Perhaps unsurprisingly the showdown has opened with an over/under of 64 points, just the third time this century that an NFL game has been given a total of 60 or more points, so fans of defence might want to watch from behind the sofa. The Chiefs are 6-0 against the Rams over the years, but that counts for little as they prepare to face a team which didn't lose their first game until week 9 and are one of the favourites for the Super Bowl next February. The Rams are missing receiver Cooper Kupp through injury, but still have plenty to offer offensively in Brandin Cooks and Robert Woods, each of whom has over 50 catches and 800 receiving yards. To be honest this is a game which provides more questions than answers with the only real certainty being that Chiefs quarterback Patrick Mahomes and his opposite number, Jared Goff, will trade touchdowns all night. So far this season Goff has thrown for 3134 yards with a completion rate of 68% while on the ground for Los Angeles Todd Gurley has rushed for almost 1000 yards on his own with Malcolm Brown some way back with 189. As for the Chiefs their offence is similarly potent with QB Patrick Mahomes completing 231 of 345 for an even more impressive 3150 yards with Kareem Hunt contributing another 754. To make matters more interesting neither team boasts outstanding defensive numbers either with the Chiefs' D ranked 29th in the league, yielding 24.0 points per game. As for the the Rams, they are ranked 20th, giving up 23.1 points per contest, though their defensive end Aaron Donald leads the league in sacks with 12.5. 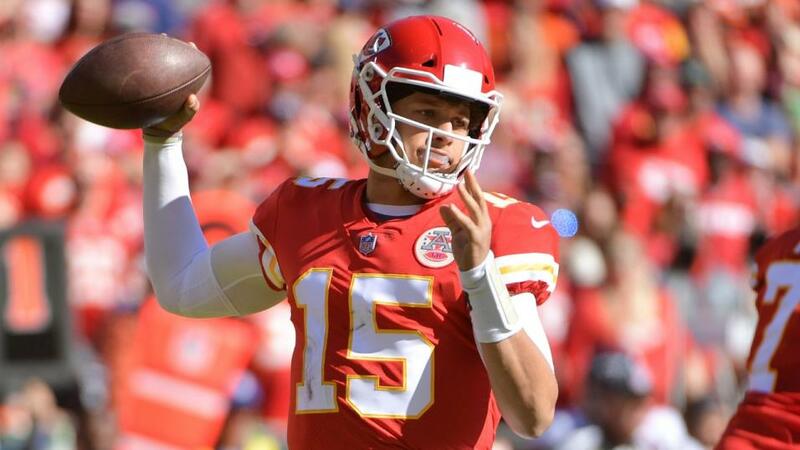 Consequently, it's difficult to see past a high-scoring slugfest, as the over/under suggests, but when it comes to picking a winner the odds might just favour Kansas City but probably by no more than a field goal. The Jaguars have long been the Steelers' nemesis but it's unlikely that will be the case on Sunday as the teams have gone in different directions since Jacksonville defeated the AFC champions in emphatic style last January. That's because, despite all the pre-season hype, the Jags are a team in turmoil having struggled to find a world-class quarter back while they can no longer rely on their solid defence to bail out an inconsistent offence. To add to Jacksonville's woes the Steelers have won their last five games, including a 52-point blowout against the Panthers just last week courtesy of an offence which is one of the best around. Meanwhile, their defence has finally started to play like a top-10 unit and it's hard to see anything more than a win by seven points or more for Pittsburgh. It's a four-fold this week, with the choices being: Indianapolis (-2) 9/10, LA Chargers (-7.5) 21/20, Pittsburgh (-5) 9/10 and New Orleans (-7.5) 9/10 which, at the time of writing, is available at 14.81 on the Sportsbook. Indianapolis has followed a four-game losing streak with three straight wins, including a 29-26 victory over Jacksonville last Sunday, as Andrew Luck threw three TD passes and it's a fair bet that he's now back in pre-shoulder surgery form and probably offers too much for the Titans. The Chargers won their sixth in a row on Sunday with a 20-6 road victory over Oakland in what is the team's longest winning streak since 2009 whereas the Broncos have been nothing short of terrible on their travels over the past few seasons. The Steelers are on extra rest after a shock hammering of the Panthers 52-21 last Thursday to seal a fifth straight win while Jacksonville have now lost five on the spin and hard to back. Meanwhile, the New Orleans Saints are on an eight-game winning streak having destroyed the Bengals on their field last Sunday and the Eagles looked poor Sunday night in a 27-20 home loss to Dallas. The Texans are on a six-game winning streak following a poor start and top the AFC South while the Redskins lead the NFC East and though they were statistically dominated by Tampa Bay last week won 16-3 thanks to four takeaways and are 5/4 on the Moneyline to repeat that feat. Pretty much the only game of the weekend with nothing riding on it and where both teams have zero chance at the playoffs this could be hard to watch as two of the league's worst offences go head-to-head, so the only real entertainment might be backing Oakland at 6/4 on the Moneyline. If you're a fan of the 3TDs for both teams in each half bet then look no further than the game in Mexico City between the Chiefs and the Rams at 150/1. A syndicate has been set up for those who want to win more and you can join here and play for £100,000 as seven games are picked with a variety of score margins to choose from.